Dreaming about Mercy International Centre soon got translated into practical planning. Firstly there needed to be a thorough investigation of the possibilities of restoration. Then attention needed to be given to the appointment of a project director and task forces to flesh out programmes; estimate costs and consultation with the architect regarding space needs. In August 1989 Sr. Canice Hanrahan (Ireland) was authorized by the Steering Committee to attend to the assessment of the building. The report from the surveys indicated that the original building was sound, however the hostel building had serious structural concerns. 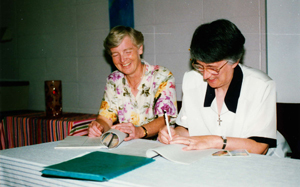 In early 1990, Sr. Mary Quinn (Australia) was engaged as Project Director. Networking for Core Planning groups and national interests groups was established. The Chair persons of the Planning Groups, Heritage (Mercedes McCarthy) Renewal (Carol Rittner rsm) and Ministry(Attracta Canny rsm) were briefed to bring forward proposals for each of the dimensions by June. Even though pilgrimage/heritage was chaired by England, renewal by the Americas and ministry by Ireland, local creativity and participation for these areas came from committees formed in many countries. The challenge came in July 1990 when the three task forces were to share their proposals and work together with the Steering Committee and consultants to integrate ideas and plans into the proposal. As the task force proposals were presented, integrating lights went on and questions and suggestions gave form to the project. A center for Mercy spirituality could have important implications but the core of mercy must be ensured so that self-renewal not become isolated. A hope was expressed that a Solidarity Desk for International Peace and Justice be integrally linked with renewal. The concept of linking hospitality and teachable moments was affirmed. A call emerged to re-image Mercy; to present our heritage as well as our contemporary expression in a global context. It seemed right that the first house of Mercy continue in some way to serve the poor of Dublin. Revisions were made in light of the feedback generated in the course of the corporate reflection process. It was beginning to look like one project! Great efforts were made within the limits of time, budget, and distance to gather a group representative of the diversity to review the proposals developed by the three core planning groups namely: heritage, ministry, and renewal. The understanding of the approaches of different cultures and the give and take required by this international task was a challenge to all. A description of the meeting states: "We found ourselves in Catherine's 'Grand Right and Left' being carried at times in the natural flow of the universal dance of Mercy and at other times stepping on each other's toes as we learned to understand each other's cues." financial plan for the renovation, construction, and maintenance of the Baggot Street property. In December 1990 the International Steering Committee met and received the Proposal for World Mercy Centre which called for the renovation of the original House on Baggot St. and the demolition and rebuilding of the hostel on Herbert St. The estimated cost was 2.6 million Irish pounds. The Steering Committee agreed to take the proposal to their respective national conferences and congregations for review in early January. In April -May 1991 the Steering Committee re-convened to review the input of the national conferences. The committee considered the responses of sisters worldwide and tried to discern as one body the common desires around Baggot Street. In dialogue with the Architect and Project Manager, they scaled back the project in light of financial concerns expressed. The revised proposal involved only the renovation of the original building thus reducing the cost to 1.7 million Irish pounds. 1. To preserve our heritage, this sacred space and story, the birthright of every Sister of Mercy; and make its animating power accessible for our time and for those who follow us into the future. 2. To continue the rich tradition of Mercy hospitality at Baggot Street: welcoming into the first House of Mercy all who come, the poor and the pilgrim alike; and welcoming home to their roots the world-wide family of Mercy. The family of Mercy includes Sisters, Associates and Colleagues who have been drawn by God into a shared Mission of Mercy. 3. To link creatively all the branches of Mercy worldwide, facilitating communication among the various parts, and at the same time, enabling the parts and the whole to become visible to each other and to the world, in a re-imaged global identity. 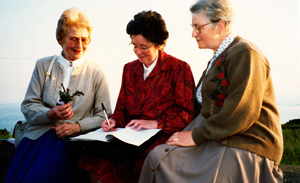 Through her letters and visits Catherine provided a unifying centre through which the members of her new Institute were enabled to maintain mutually supportive relationships with one another. While autonomous in governance they clearly belonged to one another and came to one another's aid in times of difficulty as well as in shared communal joy in blessings received by anyone group. 4. To birth a future where, in the spirit of Catherine, we can be globally interconnected and where we can connect the rich and the poor for the life of the world. The ministry of International Justice requires that we approach issues not simply as single Congregations, but that we maximize our potential to bring our corporate resources and influence to bear on the global inter- relationships of rich and poor as well as global environmental concerns. 6. To respond in a concrete way to the cries of the poor in Dublin, through the House of Mercy, Baggot St.
To continue to dialogue with our Irish Sisters regarding the best way to express Catherine's option for the poor in this site. 7. To link our sisters in indigenous cultures in the Pacific, Africa, Asia and Latin America with their roots in Catherine McAuley, empowering them in any way we can to take Mercy into the future. To seek creative means to bring the perspective of these countries and cultures into the shaping of our consciousness at World Mercy Centre. By June 1992 the Memorandum and Articles of Association of Mercy International Association were adopted. The transfer Deed was prepared in which the Dublin Congregation transferred ownership of the original property on Baggot Street to Mercy International Association (of which they were a part). The hostel building was to stay in the ownership of the Dublin Congregation and/or its successor corporation the Sisters of Mercy of Ireland. Mary Trainer rsm was appointed full time Project Director, and Elizabeth Mc Caver rsm came on full time to assist in managing the Finances, Construction, and preparation of the renovated facility for occupancy. Sisters Mercedes Mc Carthy, Felicitas Powers and Magdalena Frisby agreed to work on a part-time basis with the archives. Sr. Mercedes worked with Mary in the planning and development of the Heritage component of the new Center. The Design Team worked on adjusting the plans from the original proposal to the revised one, consisting of the original building only. 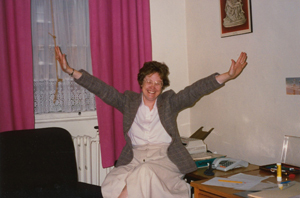 In March 1993 The remaining core group of Dublin sisters moved out of Baggot St. Mary Trainer and Elizabeth McCaver moved into McAuley wing. The original building closed and construction began. In April 1993 Members of Mercy International Association interviewed and selected the first team for Mercy International Centre. Pat Ryan rsm was named Director, with Sisters Ursula Gilbert, Josephine Grey, Mercedes McCarthy, and Elizabeth Mc Caver named as part of the team, who would manage and operate the Centre once it opened. They were asked to arrive in early spring of 1994 to assist in preparing for the opening date set for July 1994. Mary Trainer rsm continued as Project Director until the dedication. "We are in a Kairos time, with a drastic demise occurring in some parts of the world, even while our numbers grow in the Third World. Worldwide, there is still enormous creativity and energy. We must utilize both the talent and the technology available among us to ensure the proper telling of our story in all its richness. Our story is not only the story of Catherine McAuley but of generations of women in whom Mercy has called forth a passionate and realistic response to the cry of the poor. Today the cries have assumed global proportions. We are being challenged to link with one another right across the world so that the Broken Heart of Mercy can enter more deeply into us and embrace God's beloved poor." Your browser does not support Flash content. Please download and install the latest version of the Flash plug-in to view this content.